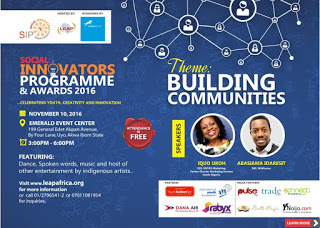 LEAP Africa 2016 Social Innovators Awards | TMC | Toki Mabogunje & Co.
On November 10 2016, the LEAP Africa 2016 Social Innovators Awards will take place. It will be happening at Akwa Ibom, Nigeria. Nigeria faces a lot of challenges, in education, healthcare, technology, finance and other sectors. Our country needs youth who are tired of the status quo and are taking action by creatively tackling problems in their communities. Coming to Akwa-Ibom this year, LEAP Africa’s Social Innovators Awards will celebrate 40 innovative Nigerians, whose initiatives are creating change and are restoring hope to communities across Nigeria.